Washington DC – People are getting nervous inside the beltway and members of Congress are anxious to take action. That wait won’t be long now. Speaker Boehner and Leader Reid are closer to bringing both Chambers together for a vote on the debt ceiling and an agreement on reopening the government within the time frame of negotiations. Members will be busy reopening offices to better serve constituents. Where is tax reform for the estate tax in all this? Tax Reform is still possible. In fact, with the increased pressure to come together it makes for almost the perfect time to include tax reform in the mix. Some times when there are lots of moving parts, it’s the best time to get something as comprehensive as tax reform injected into the conversation. 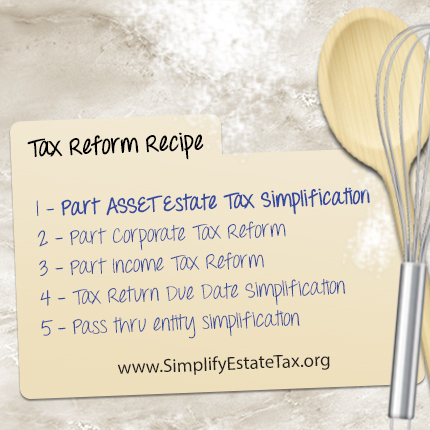 Our goal is to assure that the ASSET estate tax reform be included in the recipe. Your ASSET team has our collective ear to the ground, and we know there has been a lot of talk about corporate tax reform. Meetings with think tanks and staff even while the government is shut down are filled with rumors of what will and will not be included in tax reform. Some say the estate tax was already worked on. Others say we need a vote for repeal, because we haven’t had one in eight years. The good news is, we are reaching the decision makers who create the recipe. We want to hear from our members and supports about how the estate tax is currently impacting your business, farm and ranch. Are you siphoning away money that could be reinvested in the business to pay for an excessive amount of life insurance? Are you spending money on lawyers, accountants, financial planners and others to find a way to minimize the estate tax? 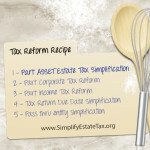 Are you faced with the decision to sell some or part of your assets in order to pay the estate tax? Are you being forced to sell your business and disrupt jobs? Are you fearful that when the founder of your farm, ranch or business passes on that you will be forced to close? Are you faced with putting assets in a trust in order to avoid the estate tax? Losing control?